A home addition is an excellent way to expand your home’s living space. The key secret on how to get home addition estimates that are both accurate and within your budget is to first develop your own set of home addition plans and requirements. To obtain accurate home addition estimates start by specifying the size of your home addition, and the location of it relative to your existing home. As part of this process, you may need to contact your local town zoning board or building inspector to fully understand what size of a home addition you can build and where you can locate it relative to your existing home and property. Use a few stakes and string to mark the corner boundary points of your home addition. This exercise can be a useful for judging the size of your home addition and for helping get home addition estimates. Contractors that meet with you at your home can quickly obtain a better feel of the size and location of the home addition by seeing it staked out. With the size and location of your home addition identified, continue to add detail and dimensional information to your home addition plans. Make sure to include information on interior walls, door and window sizes and locations, and roof lines. Another important home addition planning task is to develop a separate list of key features and materials you want to have in the home addition. By developing a thorough set of home addition plans, along with a list of key features and materials, you will be able to get home addition price quotes that are more accurate for your home addition project. The first step in getting home addition estimates is to find a few local contractors to bid on your home addition project. You can check the yellow pages, call friends and neighbors who have recently had home remodeling work done on their home, or use a national home addition contractor referral company. Home addition contractor referral companies are excellent resources for finding qualified, and pre-screened, home addition contractors. Contractors in their database have been thoroughly vetted out to determine if they are reputable. There is no cost to the homeowner for using one of these home addition contractor referral companies. You simply fill out an online form for your unique home addition needs and they will pass on your information to 3 or 4 local contractors in your area. The home addition contractors will then contact you to set up a time to meet with you and go over your specific home addition plans. When interviewing potential home addition contractors make sure you check their references. Typically the longer the reference list that a contractor provides to you the more likelihood that he has a solid reputation. A long reference list usually means that he is proud of his work and has a longer history in the business. However, don’t go by just the length of the list, call 3 to 4 of the references. Contact a couple references that were associated with projects done recently and then another couple that were completed 2-5 years ago. You may also want to check with your local Better Business Bureau and confirm that the contractor is licensed in your state. To help obtain home addition estimates that are accurate and within your budget, see my Home Addition Bid Sheets. 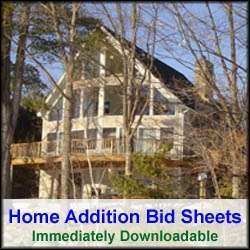 My Home Addition Bid Sheets include checklist forms that you can provide to prospective building contractors. These home addition checklist forms allow you to get consistent quotes so that you can do apple to apple comparisons. The Home Addition Bid Sheets also include comprehensive home addition cost breakdown tables, in Microsoft Excel format, that allow contractors to specify projected home addition estimates for every stage of the project. 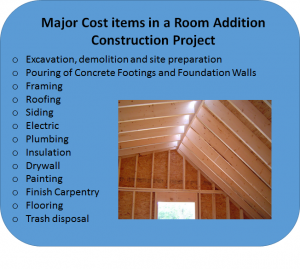 After receiving home addition estimates from your prospective building contractors it is important to study them and confirm their cost estimates for the various building materials. You may also want to visit your local home improvement center to compare material costs with their home addition estimates. By studying and comparing the multiple contractor home addition estimates and bids, you can determine which one is the most suitable home addition contractor for your project. So to conclude, the secret on how to get a home addition estimate begins with a solid set of home addition plans and finding qualified home addition contractors.